Anna’s take: Anthony’s Chophouse has a variety of terrific dishes, and I tried several, but the Jumbo Sea Scallops were by far my favorite. 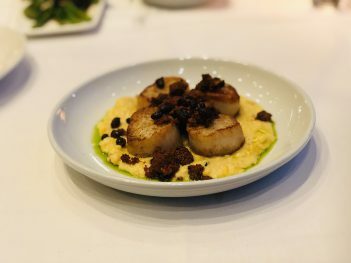 The scallops are pan-seared, served on top of a creamy grit and topped with chorizo and black beans. It’s a lighter dish that doesn’t feel as heavy as steak or pork chops (which also were delicious), but the scallops are meaty and tender. Before my main course, I sampled the tuna tataki ($16), which is sushi-grade tuna with pickled asparagus and jalapenos on the side. A wasabi avocado crema adorned the plate and was a great way to add just a touch of spice without being overbearing. The tuna tataki is dusted with a wonton crumb and the tuna slices are thick and tender. I also sampled the kale cherry salad — tossed kale, green apples, dried cherries and figs drizzled with a balsamic gastrique and lemon cherry vinaigrette on top. The salad combines sweet and tangy flavors. If you aren’t a scallops fan, try the Berkshire Chop ($31) as an entree. It is a center-cut, bone-in and slow-braised pork chop, served on top of puffed barley, which is the restaurant’s play on risotto. Topping the pork is a tangy balsamic gastrique and a thick, sweet strawberry chutney which makes this dish taste like the holidays. Anthony’s Chophouse serves its side dishes family style. A good option is creamy mac ($12), which is a delicious combo of gemelli pasta, serrano peppers, tomato skin, gouda cream and white corn crisp on top. If you’re looking for a healthier option, try the broccolini ($11). It’s served with shaved almonds, dried cherries and a white wine vinaigrette. Suggested pairings: Anthony’s Chophouse has excellent, unique cocktail selections and I would suggest going with one of those. My personal favorites are the Chophouse Old Fashioned and the Dirty Dancer – a spicy play on a vodka martini with sriracha.